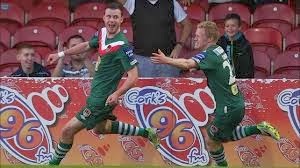 Kilduff wheels away in celebration after putting Cork City 3-0 up against St.Pats. Four goals in one game against Shelbourne, a goal and a man of the match performance in the last game of the season against champions St.Pats and a player of the month award to round it off. Not a bad months’ work from Kilcock man Ciarán Kilduff who rounded off his loan spell with Cork City in emphatic fashion. However, despite this form Kilduff has no idea whose shirt he will be wearing next season. The 25-year-old former Kilcock Celtic front man was named Airtricity/SWAI Player of the Month after starring on Leeside following his loan move from Shamrock Rovers, which has now come to an end. The Shelbourne game was a special one for Kilduff as he became the first Cork City player to score four goals in one league game and in doing so making himself a firm fan favourite on Leeside. On a personal level it was his first four-timer having previously scored two hat-tricks in his career. Speaking to Kilduff as he took a few days rest in his hometown, he said; “The Shels game was clearly a special, special night for me. To score four goals in a game is something I won’t forget, but really it’s down to the hard work of the players around me”. Kilduff who finished the season with 14 league goals (3 for Shamrock Rovers) and 3 Setanta Cup goals for Rovers, felt that he got better as the year wore on; “With each passing game at Cork I could feel myself getting stronger and stronger and I am grateful for the chance to play as I have done”. Picking up the player of the month award for October was the icing on the cake for Kilduff who finished the season on a high after linking up well with strike partner Danny Morrissey following Stuart Ashton’s influence as interim boss. “It was a great feeling to win player of the month. There are so many good players in the country, so to win that award was special. I won a player of the month back in my UCD days but that was when I was in the First Division, so this was my first premier division player of the month”. Winning the prize really capped a great month and season for Kilduff with Cork City. “My time at cork city was brilliant. I went down there to get some more game time and to hopefully score some goals and thankfully I managed to do both. It’s a great club and is surrounded by good people. I more than enjoyed my four months down there on and off the pitch”. When asked about his future and a possible Ireland cap having been linked with Ipswich Town a couple of years back when they were under new Ireland number two Roy Keane, Kilduff laughed; “With regard where to next, I still have a few things up in the air. I have a year left on my current contract with Shamrock Rovers. Talks have been ongoing! As to where to next? I just have to sit tight and wait and see. His (Roy’s) interest seems a long time ago now but Ireland is probably a bit of a stretch. The most important thing for me next year is that I will play. I turned 25 last month and I have no desire to waste anymore time”. Kilduff initially joined Shamrock Rovers as a teenager before he made his debut at the Brandywell in 2007; the following year was spent on loan at Kildare County. A memorable two seasons at UCD followed, before he returned to Shamrock Rovers where he was used mainly as a substitute during Michael O’Neill’s historic championship winning 2011 campaign. He has been in and out of the side since and joined Cork City in July. Next Next post: V for Val – Val Cassidy – So good they named him three times! !